1. Be sure to have the correct size file and file guide. 2. When hand filing it's important that 20% of the file's diameter is always held above the cutter's top plate. Using the correct file guide is the easiest way to hold the file in this position. 3. Keep the correct top-plate filing angle line on your file guide parallel with the chain. 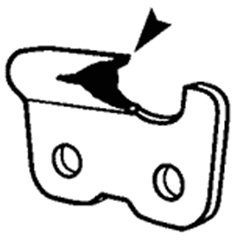 Many cutters have a guide mark stamped near the rear edge of the top plate that can also be used as a guide for filing angle. 4. Sharpen cutters on one side of the chain first. File from the inside of each cutter to the outside. Then turn your saw around and repeat the process for cutters on the other side of the chain. 5. If damage is present on the chrome surface of top plates or side plates, file back until such damage is removed. 6. Keep all cutters equal. Start with the cutter with the most damage and hand file all cutters back equally. Note: Do not file or alter the tops of kickback-reducing bumper tie straps or bumper-drive links.